Hanshi Howard Lipman, Shihan Idir Bahamid, Sensei Mark McFadden, Sensei Rob James and Shihan Rick Cunningham, 9 September 2017. Congratulations to Shihan Idir, Sensei Mark and Sensei Rob on their new grades, and their decades of devotion to martial arts and KIMAA. Shihan Idir Bahamid is 5th Dan in Kyokushin Karate, 5th Dan in Shotokan Karate and 1st Dan in Kobudo. He commenced his karate training in 1966. He trained in the style of Shotokan in Europe and North Africa with Sensei Taiji Kase, Sensei Hiroshi Shirai and Sensei Keinosuke Enoeda. He obtained his 1st Dan in Shotokan in 1971 and was graded to the rank of 5th Dan by Sensei Kasein 1988 at an international training camp in Paris. Between 1977 and 1982, Shihan Idir was instrumental in the promotion and development of Karate in Romania. He established Dojos in different cities and conducted regular training camps. After moving to Australia in 1988, he continued his karate training in Shotokan in a number of Dojos across Sydney before beginning his training in Kyokushin Karate with Hanshi Howard Lipman in 2004 at the Turramurra Dojo. He was graded to 4th Dan in Kyokushin by Hanshi Howard in 2010 and to 5th Dan in Kyokushin in 2017. Click here to see a photo gallery of Sensei Idir training in his youth, demonstrating the power of Karate. Sensei Mark McFadden is 4th Dan in Kyokushin Karate and 3rd Dan in Kobudo. He commenced his Karate training in 1980. He participated in local, state and national tournaments from 1982 to 1990, gaining places at the local and state levels. He began teaching Karate in the mid 1980s. After competing in the Australian Championships in 1990, Sensei Mark took time out to further his education, career and family. He returned to training in 1996, opening a dojo at the Fraternity Club in Fairy Meadow NSW, and graded to 1st Dan in March 2000. After relocating to the North Coast Sensei Mark opened Lismore Dojo in 2006, and in 2008 opened Ballina Dojo. 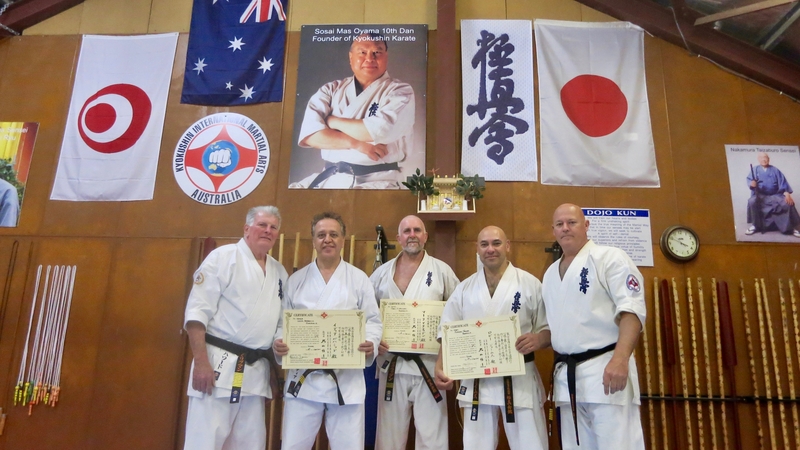 Sensei Mark regularly travels to Sydney for black belt training with other KIMAA senior grades. He has gone to Japan four times for training in 2008, 2013, 2015 and 2017. Sensei Mark was promoted to 3rd Dan by Hanshi Howard Lipman in 2013 and to 4th Dan in 2017. Sensei Rob James is 3rd Dan in Kyokushin Karate. Sensei Rob began his Martial Arts training in the late 80s in AFTA Freestyle Tae Kwon Do. Karate, being new to his home town of Inverell, soon took Sensei Rob’s interest and in time progressed to the rank of 1st Dan. After opening a Dojo in 1992, Sensei Rob contacted Hanshi Howard Lipman in Sydney and after lengthy discussions as to what would be expected of him, joined the International Karate Organisation Kyokushinkaikan. Sensei Rob, who holds Dan grades in both Shotokan and Kyokushin Karate, began teaching self defence to schools, nurses, police and community groups. Over the years Sensei Rob also studied Boxing as well as Seiyushin Karate under Sensei Nagayama, a former Kyokushin Uchi Deshi under Sosai Mas Oyama. He opened Aspley Dojo in 2012 and joined KIMAA, once again working with Hanshi Howard Lipman to spread the teachings of Kyokushin. 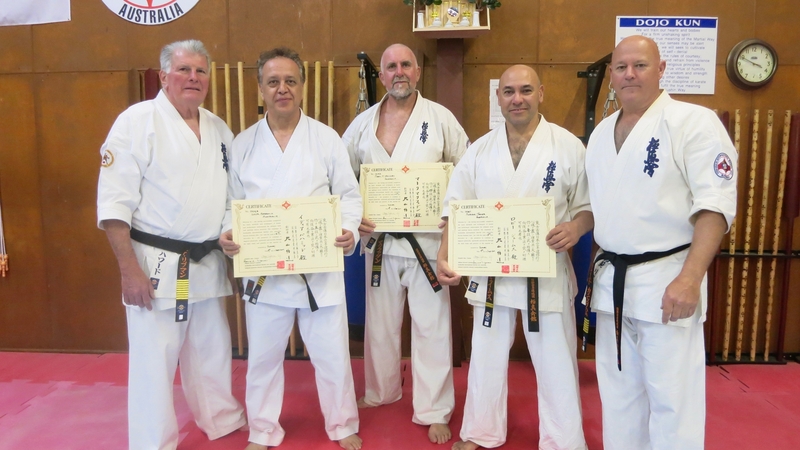 Sensei Rob was graded to 2nd Dan in 2014 by Hanshi Howard Lipman. In 2016, Aspley Dojo became North Brisbane Dojo. In the same year, Sensei Rob opened KIMAA’s sixth dojo, Nundah Dojo. He was graded to 3rd Dan (Sensei) in 2017 by Hanshi Howard Lipman. Hanshi Howard Lipman, Shihan Idir Bahamid, Sensei Mark McFadden, Sensei Rob James and Shihan Rick Cunningham.